Some buyers liked the lightness and flexibility of this shoe. The Adidas Busenitz Pro is incredibly durable, as told by a handful of wearers. The different colors released are admired by most buyers. Avid skaters praised the good balance of cushion and board feel in front, which is great for gaps during skateboarding. The design made it one of the stylish and coolest shoes, as commented by a number of buyers. Some buyers applauded the option to cut the long tongue by laying an outline. Several reviewers noted the superb comfort this shoe provides. It is easy to clean, especially the sole said by some. This pair is a bit stiff at first and needs to be broken in, complained some buyers. Some reviewers found the shoe narrow and blamed the heavy padded tongue. Few disclosed that this shoe is not true to its size. The sole traction and the suede are a tad bit slippery revealed by some wearers. Few critics told that the breathability of this pair is not that good. The skateboarding shoe Adidas Busenitz Pro has been applauded by the majority of reviewers for its durability and superb board feel to suit the stunts on board. It also displays a versatile design inserted with comfortable details to provide optimum support and protection to its wearers. Despite the reported disappointment on this pair’s grip and inconsistent sizing, this model easily landed as one of their most recommended pairs after meticulous evaluation from the experts. Adidas has developed to become one of the biggest manufacturers of sports apparel since they started way back in 1949. In the middle 1990s, they commenced their Skateboarding Footwear line which is composed of various team riders. This line was reintroduced in mid 2000s, and named it Adidas Skateboarding with solid team members, namely Mark Gonzalez, Tim O’Connor and Dennis Busenitz. Dennis Busenitz, is a 31-year-old professional skater, who used to live in Munich, Germany. He has been photographed many times using a soccer jersey for endorsements and that only showed that he is into football sports. When Adidas tapped Busenitz to become a part of their Skateboarding line, his only conditions were to use a cupsole instead of a vulcanized shoe because he wanted to be different from most of the other existing shoes at that time. Most of all, he wanted a soccer-based shoe as a big part of the project. He was involved in the conceptualizing and designing part and took inspiration from his favorite soccer cleat and transformed it into a street-ready skate shoe. He created an arrow-shaped toebox and the stitching in the front foot area, a layout motivated by the football classic shoe Copa Mundial. Stylists and conventional thrashers have come up with ways on how to style their Busenitz Pro pair by altering the remarkable long tongue. The first is simply by wearing it and keeping the tongue as it is. Second is by folding the long tongue and tie the lace behind or over the folded tongue. And the third way is to cut the tongue along the outline provided. This Busenitz Pro pair is also a little pointy which makes it perfect for flip tricks. Thrashers usually pair these pointy sneakers with baggy jeans, oversized tees and a trucker hat. This design has safely crossed the bridge that discerns the sports wear from the casual wear. 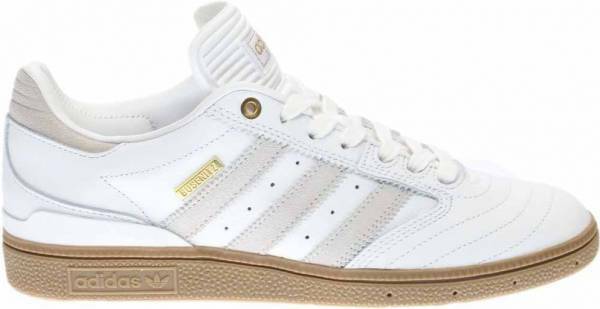 This Busenitz Pro model has an arrow-shape toebox as inspired by the Copa Mundial soccer shoe, thus this pair is a little bit narrow compared to other skateboard shoes of Adidas. It has well cushioned insole and heels are slightly elevated than the toe and the collar lining has the very soft foam GeoFit. The Adidas Busenitz Pro is being offered in men’s size and available in 6.5 to 12.5 US. Busenitz Pro has a long tongue compared to the usual other shoes available in the market. It has dotted lines on the inside of the tongue which will serve as your guide on where to cut. This allows you to personalize the length of the tongue and have the “Busenitz Light” or you may keep it that way. Busenitz Pro has plus durable suede upper with 3 stripes. It has molded Polyurethane sockliner for added comfort and protection. A soft foam, The GeoFit Collar Lining, increases stability on the ankle. There’s an external heel stabilizer which provides additional medial stability. It has a light rubber cupsole with deep tread pattern which enhances the board feel and protects the wearer when skating on stairsets. The cupsole is well cushioned for protection during hard landing. It has plastic heel cup inserts which holds the ankle in proper position. The eyelets available on the first 3 rows allow you to lace more or less while skating.